Here’s an excellent video by Jordan Peterson and Stefan Molyneux about IQ and how Charles Murray’s The Bell Curve is becoming reality in terms of IQ predicting social stratification, but also how IQ is immutable, impervious to ‘brain training’, and intrinsic to the individual. The depressing reality is that 10% of the population (IQ less than 83) is not smart enough to be useful to society. However, many hands-on jobs in the IQ 85-100 range (service sector, food preparation, delivery, warehouse, etc.) seem to be impervious to automation though, so it’s not all bad. It’s the fine motor skills and human interaction part that is hard to automate. AI seems to be better suited at parsing data. Stratification, which is covered in Charles Murray’s Coming Apart, is probably a bigger or more realistic concern than automation. Counterintuitively, those with IQs in the 110-125 range, who make up the ‘professional middle class’ may be the most at-risk of automation and downgrade in lifestyle. This is evidenced by how many college grads (who typically have IQs 1-SD above average) find themselves in low-paying jobs, working alongside IQ 90-100 workers. Many lower-middle class jobs are either being outsourced, automated, or eliminated. The ‘creative class’, however, is doing better. Individuals with IQs above 130 (2 standard deviations), who make up the ‘cognitive elite’, can still find gainful employment due to the ability to acquire scarce, good-paying, highly-sought after skills such as coding. The part about people with IQs below 83 “not being smart enough to be useful to society” may seem extreme, but it’s collaborated by many studies. A common misconception is that anyone who isn’t retarded can find work, one needs an IQ two-thirds of a standard deviation (10 points) above retardation to find employment for even the lowest-paying, lowest-status of professions. 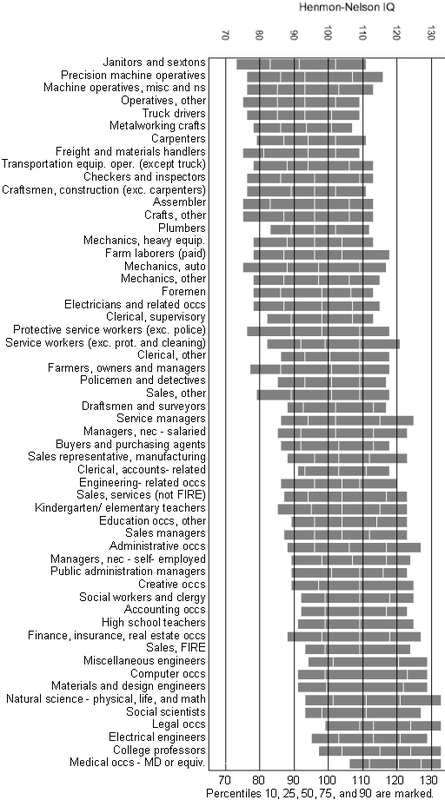 If the 25th WPT percentile of applicants is used to estimate the minimum threshold for employability in an occupation, it suggests that virtually all occupations accommodate individuals down to IQ 110, but virtually none routinely accommodates individuals below IQ 80 (WPT 10). 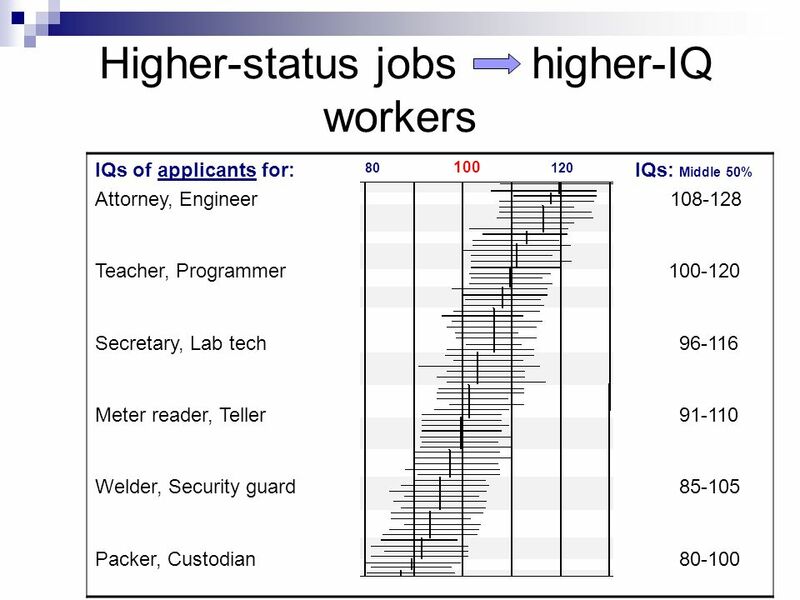 Employment options drop dramatically with IQ-from virtually unlimited above IQ 120 to scant below IQ 80. Such options are virtually nonexistent today (except in sheltered settings) for individuals below IQ 70 to 75, the usual threshold for borderline mental retardation. However, this is does not mean individuals with IQs less than 80 cannot learn limited skills. For example, some grocery stores and restaurants ‘hire’ people with Down’s Syndrome. But just because they are working doesn’t mean the are a net-positive. In the case of the Down Syndrome workers, it may be a charity case in which the food store is subsidized to hire the disabled. Although a sub-80 person, with enough repetitions, could probably learn such skills, the time investment makes such employees unprofitable.